Equality between the sexes has always been a prominent issue, but recently, it feels like we’re seeing a whole lot more about it in the media. I’m not sure if it was because of Hilary Clinton’s campaign to become the first female American president, because of the worldwide Women’s March, or because of the arrival of an all-female AFL competition, but it feels like 2017 is heralding in a new wave of feminism and women’s rights. Everywhere you look there are messages of female empowerment and equality for all. 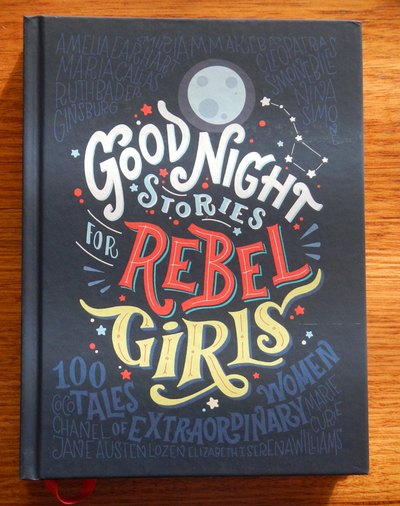 Perhaps this is why the book Good Night Stories For Rebel Girls has been so successful. As the most-funded original book in the history of crowdfunding (through website Kickstarter), this collection of stories is both inspirational and motivating- both for the young girls it is aimed at, as well as older women who want to read upon some of the world’s most inspiring women. Featuring the real-life stories of 100 heroic women, this book aims to ‘reinvent’ fairy tales, where there is always a damsel in distress who needs to be saved by a prince. Instead, young readers are introduced to a selection of women who have made a difference in the world as we know it, stepping outside the boundaries of what was considered the norm, and changed the way that we perceive life today. These women are pioneers, scientists, sports stars, royals, activists and artists, among a range of other professions and titles. They have made discoveries, challenged people and ideals, and ‘rebelled’ against society. Many of the names, including Helen Keller, the Bronte sisters, Rosa Parks, Margaret Thatcher, Joan Jett and Malala Yousafzai will be familiar, but others, like Lella Lombardi (a Formula One racer) and Sylvia Earle (a marine biologist) may not be as well known. The beauty of this book is that it gives you their story (in a brief, fairy-tale format) over the space of a page, along with their name, what they were known for, and the dates of their birth (and death, if applicable). This information gives readers the opportunity to do more research on the women who pique their interest. Each profile is also accompanied by an illustration of the woman in question, created especially for the book by an artist collective of 60 female artists from around the world. This is a fantastic collection of stories about some of the most extraordinary women who have ever lived, and an inspirational addition to the bookshelf of any ‘rebel girl’.